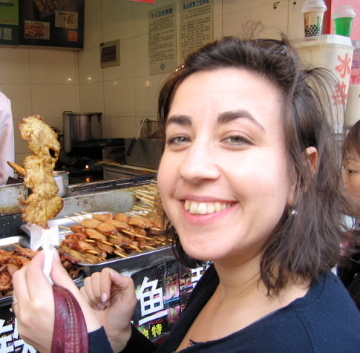 This week’s Best Women’s Travel Writing 2010 contributor has circumnavigated the globe in her search for food so spicy, she’d ignite on contact (as she once watched her grandfather do): Alison Stein Wellner. She is the culinary travel guide for About.com, a blogger for Luxist, and has contributed to Business Week, Glamour, Men’s Journal, and Mother Jones, among other publications. Home for me is New York City. I was born here, I grew up here, I left for college and stayed away for another eight years after that. I returned six years ago, and the world felt right again. I’m always oriented when I’m in New York in a way that I’ve never felt anywhere else. In fact, New York isn’t just a home, being a New Yorker is also my identity, far more so than any nationality, religion, ethnicity, school, what-have-you. And by this, I don’t mean any stereotype that people have about “New Yorkers,” all black-clad and rude and teetering on impossible heels and clubbing to all hours of the night — which isn’t like any native New Yorker that I know! I didn’t seriously start to travel until I was an adult. I was not content with this situation, in fact, when I took my first trip that required an airplane, to Disney World, at age 8, I already felt hopelessly behind. (I came across a story I wrote from that trip a couple of years ago, and wrote about it here). I started writing professionally (and freelance full-time) right after college, and while I wasn’t writing about travel at first, I was always interested in environments that felt alien to me. In fact, I started out writing about agriculture; farming certainly about as far as you can get from my upbringing. Then, I spent a lot of time writing about business. I’ve never held a grown-up office job for more than a few months, so that was fascinating for a while, writing about all those people who drive to office parks and fill out memos and take meetings and such. I also wrote about a lot of other subjects for magazines — health, women’s issues, art, politics, philanthropy… I put my husband through law school with all those words, and when that was done, I turned my attention fully towards travel and writing about it. My father died when I was an infant, so I would pick him. We could go anywhere. Maybe the Bronx in the 1960s, which is where he grew up. The thing about travel dreams is that they’re so personal — a product of fantasies and reading and movies and everything that makes a person who they are. I don’t want to tell anyone where they *must* go, I don’t think it’s any of my business. I realize this is perhaps a strange position for a travel writer to take. That travel isn’t removed from life generally, nothing is, in fact, and it all counts. I think that one reason people like to travel is that it shakes them out of their routine, wakes them up to all the details of everyday, at-home life that become so numbingly familiar from sheer repetition. When you’re traveling, you’re by definition out of your routine, it’s all different — the bed you wake up in, where the light switches are, what you’re going to have for breakfast, and on and on. Traveling days seems to last so much longer than at-home days because of the rapt attention that we pay to all of these details that we so often gloss over at home. I don’t want to a miss a moment of my life, whether it’s at home or on the road, and travel has pointed out to me how often I tune out the familiar. My favorite professor in college once said that she always considered travel an investment in herself. I completely agree. Of course, the investment you can make is dependent on your resources, and so (related to my previous answer) if there ever comes a time when I can no longer travel far and wide, I’d hope that I would tackle whatever territory was within my reach with the attitude of an explorer. This was a great interview, Stephanie! SO happy to see an interview with Alison here. I love her writing and her insistence on not getting pigeonholed as a writer and a person.